Dr. LaShore is currently a Lecturer in the WSU School of Social Work and part-time Faculty member. Dr. LaShore began her tenure with Wayne State University in 2006 as an Academic Services Officer I/ B.S.W. Academic Advisor for the Office of Admissions and Student Services. 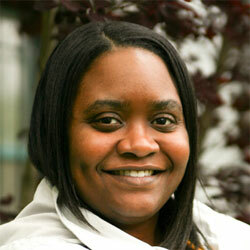 She moved to the School of Social Work’s Office of Field Education in 2008. Dr. LaShore has been invited to present locally, nationally, and internationally on topics related to the state of black youth (Detroit MI 2017), child welfare training for social work students (Dallas TX 2017), student success (St. Louis MO 2017), projective identification (England 2017), and student activism (Ireland 2018). Additionally, Dr. Lashore participates in many school committees, including the Student Academic Review Committee (Chair), Social Justice Committee (Co-chair), BSW Program Committee, Scholarship and Financial Aid Committee, and Field Education Advisory Committee. She is also a member of the Salvation Army Harbor Light Advisory Council. Dr. LaShore is responsible for internship placements of B.S.W. and M.S.W. students at the School. Her other responsibilities include co-facilitating the Seminar for Field Instructors, serving as faculty field liaison for assigned undergraduate and graduate students, and assisting with the recruitment, evaluation, and retention of agencies requesting field education affiliation. Dr. LaShore is also responsible for the development of policies and procedures related to field education, reinstatement and termination, and professional and technical standards. Additionally, she provides logistics and support for specialized training programs such as the Wayne Together Collaborative, a partnership with the Michigan Department of Health and Human Services for Wayne County.